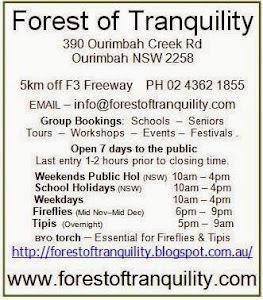 FIREFLY SEASON ... mid November to mid December is when these remarkable creatures turn out for the most spectacular light show and here at the Australian Rainforest Sanctuary we have arguably the best show in Australia! ...more details will be posted in coming weeks. 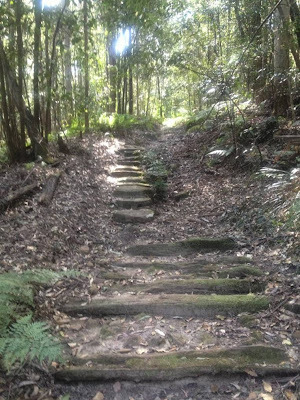 On-line booking is available via our blog http://forestoftranquility.blogspot.com.au/ by clicking the book now button. Early bird tickets $65 adult and $30 for children must be booked direct with the Forest of Tranquility by emailing fireflies@forestoftranquility.com. Note ratio of one child per adult. Early bird price still includes asian noodle dinner for adult and child. On line tickets are $85 and are non refundable but in the event of bad weather the event will be moved to the following weekend. Remember to come in costume and bring a rug and torches for your feet. Currently we are closed to the public on Mondays and Tuesdays until Firefly Season opens in order to carry out further track repairs.